CONMEBOL president Alejandro Dominguez insisted that football will triumph over violence as Boca Juniors and River Plate contest the Copa Libertadores final at Real Madrid's Santiago Bernabeu stadium. The head of South American football's governing body said the game would demonstrate the level of respect shared between Argentina's fiercest rivals, and backed the Spanish police to ensure the match takes place without any problems. 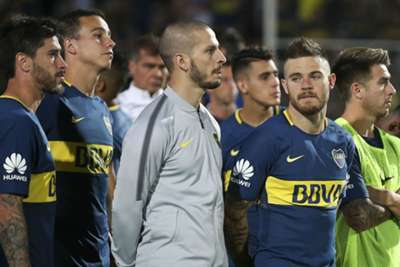 The second leg of the final was scheduled to be played at River's El Monumental stadium on November 24, but an attack on Boca's team bus left Pablo Perez and Gonzalo Lamardo requiring medical examinations. River were punished by having the right to host the second leg rescinded, and CONMEBOL arranged for it to be played in Madrid instead. The governing body has received criticism for choosing to host the match in the capital of a country that once colonised much of South America, but Dominguez told Marca: "Madrid combines everything we need for this game to be played, but of course there are things to improve. "I trust the Police and the Spanish authorities. It is a game that is decided with goals. It is won and lost. It is the sport and next year will roll the ball and whoever loses will have his revenge." The first leg of the match ended in a 2-2 draw, and Dominguez played down the importance of the result in a second leg that will be watched around the world. "The greatest triumph is that football will always win against the violent," he said. "The game is going to play and the ball is not going to stop. Soccer is not won with violence. "It will show the world that there is respect for the rival and that without rivalry there is no football. There is one that will win and another that does not, and that does not mean that whoever does not win lost forever."